What Happened To Gareth Ridpath? Just over a year ago, Englishman Gareth Ridpath was at the Sebring test days (the first Wheels Down Winter Test), trying a sports prototype for the first time – the Intersport Lola B01/60 (below, with Clint Field). 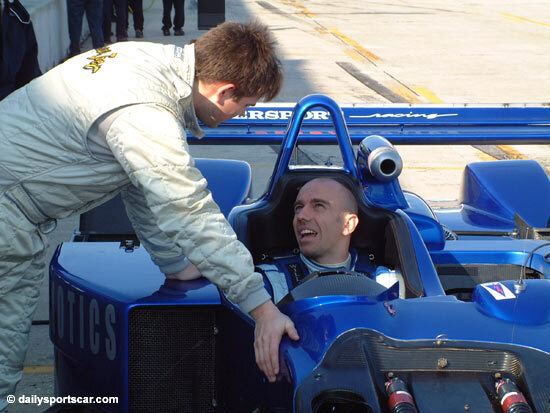 Ridpath was expecting to be part of the Intersport / Telesis liaison in 2005, but sadly, that went no further (for him or the team) than a drive in the Sebring 12 Hours (in the Intersport Lola B2K/40 Judd). That was the last race for the B2K/40, although it was entered at Atlanta a month later – but then withdrawn. Ben Ingram was the Telesis part of the arrangement, but he disappeared as quickly as he arrived, leaving Intersport and Gareth Ridpath to shrug their collective shoulders. Intersport bounced back straight away with the new B05/40, but it’s taken Gareth Ridpath a little longer – just over a year in fact. The Cornwall-based racer had Champ Car aspirations a year ago, and now those seem to be coming to fruition. Bill Harris has a long history in many different branches of the sport (he was a very influential part of the McLaren F1 road car programme for example), and spent much of 2005 as team manager for the Piquet Sport team in GP2 – but we may not have lost him and his driver from sportscar racing just yet. Bill Harris, in his driver management role, is Race Tec UK: let’s hope he and Gareth Ridpath are present at Le Mans in June.